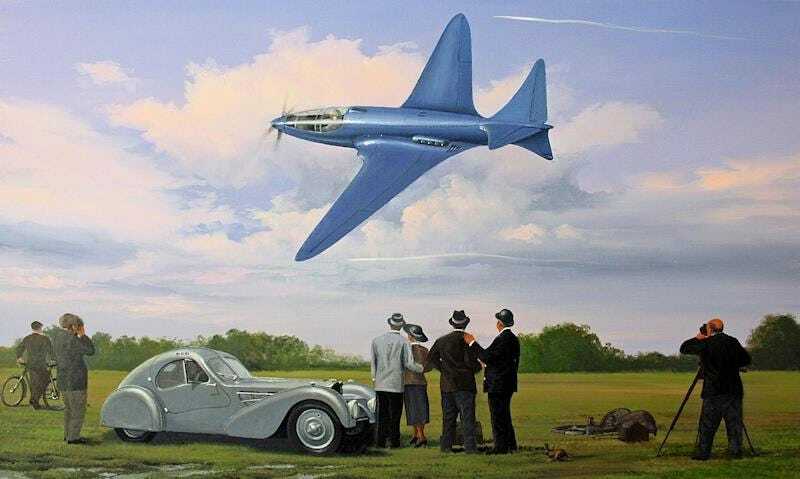 In 1938, with dreams of taking out one of Europe’s most prestigious air races, Ettore Bugatti—yes, the car guy—and Belgian engineer Louis de Monge got to work designing an aircraft like nothing the world had ever seen before. With one eye on using the aircraft’s engines as marketing for Bugatti’s automobile business (much like modern sports like F1 and Rally do today), and the other on simply making something wonderful, the pair came up with the Model 100. What strikes you first about the Model 100 is its radical shape. How far ahead of its time it was. It looks like something from a sci-fi anime, or a NASA design contest from the 1980s. The fact it was designed in the 1930s, years before the drive and necessity of the Second World War brought us other futuristic stuff like the Ho 229, is just insane. Looking past the unique, slender fuselage and bulbous cockpit, though, and there are some true marvels of aeronautical design on show. It had twin engines, both of them located internally (behind the pilot), which powered a pair of counter-rotating propellers. The Model 100 had wings that swept forwards, not backwards. Few aircraft have dared try this arrangement, even today, because it’s more taxing on the plane’s structure and can be more unstable in certain circumstances. Rather than a traditional tail design, using a combination of horizontal and vertical control surfaces, the Model 100 featured an experimental V-tail, with two “fins” separated at 120 degrees. So revolutionary was the Model 100’s design that, before it could even be completed, the French government spoke with Bugatti about a military version, which would potentially serve as a frontline fighter for the French Air Force. Yet the French would never get their fighter, and Bugatti would never win that race (the Deutsch de la Meurthe Cup). Before work on the Model 100 could be completed, the Second World War kicked off. The sole prototype aircraft was taken apart and hidden on Bugatti’s farm in rural France just prior to the German invasion of France, and that was that. For all the daring and promise inherent in its design, the prototype Model 100—the only one ever built—had never actually flown. When the war ended in 1945, the Model 100 was moved around between private buyers and museums, before being fully restored and finding a permanent home at the Experimental Aircraft Association’s AirVenture Museum in Oshkosh, Wisconsin. Which should have been the end of the Model 100’s story, but recently a team of enthusiasts and engineers have launched a project aimed at building their own replica (above) of the Model 100. A replica that’s designed to actually fly, and let the world finally see what this extraordinary aircraft can do. After years of design and construction, this replica Model 100 is almost ready to take to the skies. Earlier this month, it was able to taxi down a runway under its own power (below), meaning a test flight hopefully isn’t too far away. It’ll be a brave pilot who takes to the skies in such a radical, untested aircraft, but it’s not like the aerodynamic potential of the Model 100 is a complete mystery. There have been RC versions of the thing for a while, and as this one (built and flown last year) shows, it has no trouble taking off, flying around nicely and then landing in one piece again. If you want to keep up with the project trying to get this remarkable aircraft into the skies, you can check out their site here.